The presence of immature hematopoietic cells (CFU-S, CFU-GM, BFU-E) in the peripheral blood during recovery from hematopoietic stress is thought to be an event accompanying the redistribution of hematopoiesis. 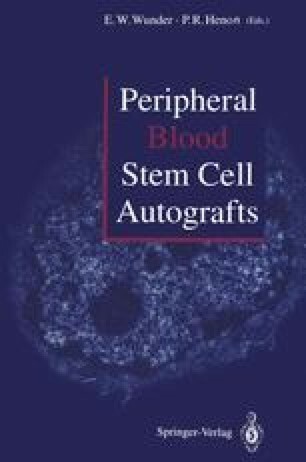 The harvest of these cells from the peripheral blood appears to be a valuable method in (auto)grafting. Insight into the processes following hematopoietic stress may improve the applicability of circulating immature cells in the cure of hematopoietic failure [1–3]. This work was supported by the Deutsche Forschungsgemeinschaft (Grant Lo 342/1–2).